Why Don't I Get Sound from My Computer? (A Checklist) - Ask Leo! A lack of sound can happen for a variety of reasons. Here's what to look for if your computer isn't making sound. Try as I might, I can’t get my computer to output sound. Nothing. I can’t figure out what’s wrong. That’s actually a composite of questions that I get very, very often. Sometimes it applies to only specific applications; other times it applies to the entire machine. The problem is, it’s a single silent symptom that can come from several sources. So, let’s run down a bit of a checklist. Let’s start with what many people would consider the most obvious things. Probably about half the people I hear from find their answer in this first list. Mute: Make sure sound isn’t muted in Windows. 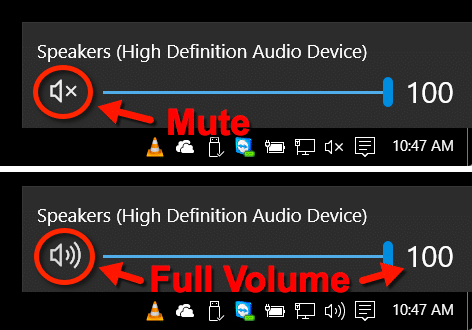 Click the speaker icon (found in the Taskbar) and make sure the Mute indication isn’t present. It actually should show in the sound icon as well, but sometimes, I’ve seen it get out of sync. Connected: Are the speakers connected properly? Double check. An un-plugged speaker wire can, and often does, cause exactly this symptom. Power: Do the speakers require power, and if so, are they plugged in/turned on, and is their volume turned up? This gets me every time I rearrange my desk, as the speakers I have get their power by being plugged into the monitor to which they are attached. I forget every time. Next, we’ll look at factors controlled by software and Windows itself. Volume: Check the volume control. Once again, just click that speaker icon in the Taskbar tray and make sure the output level is set to something above zero. Mixer: Check the mixer. This is easily overlooked. Right-click the speaker icon and click on Open Volume Mixer. The master volume control manages the output of all possible sound sources at once. In the mixer, you’ll find several different sound sources that each have their own volume control. Application Volume: Many applications will have their own volume control displayed here; for example VLC Media Player is included above. Check the application from which you expect to hear sound and make sure that its own volume control is set appropriately. Output Device: Is the correct output device selected in Windows? Just as you can have multiple inputs, Windows also supports multiple outputs, as in multiple speakers or output devices. Right-click on the speaker icon and click on Sound Settings. Make sure that the correct one is selected. Drivers: Are the drivers up-to-date for the sound hardware? This is rare, but I include it for completeness. Sometimes the drivers are at fault. That can be repaired by updating or re-installing the drivers associated with your computer’s audio hardware. Speaking of hardware, many people are quick to assume it’s a software problem when perhaps something more fundamental is wrong. Cable condition: Is the cable to the speakers in good condition? I’ve had at least one person report back to me that the sound had stopped because her cat had chewed through the wires. Even if you don’t have pets, many audio cables used for inexpensive computer speakers are themselves fairly inexpensive and easy to damage. Cable connection: Is the audio cable plugged in securely? And to the right place? Once again, I ran into this one after moving my computer. Not only was the connector not completely pushed in, but I tend to plug it into the wrong socket. Make sure yours is correct. As you can see, there are many, many possibilities when your computer goes silent. Careful detective work with this checklist usually clears things up. Why Don’t My Speakers Work? - Suddenly losing your computer's sound can be due to many different things. I'll point out a common problem that many people aren't aware of that is very easy to fix. Why Am I Getting the “USB Inserted” Sound When I Haven’t Inserted Anything? - This is a system sound that could even be indicating an internal event. We'll try to track down its source. Why Does My Sound Quality Degrade over Time? - The system degrading over time sounds like a software problem. So how do we find out what's using the CPU? Why Won’t My Computer Return from Standby? - Windows has the option of numerous types of software and hardware being installed. That leads to a complicated situation for standby to deal with. It easily goes wrong. A good checklist, and i remember my first sound card which was a nightmare to set up. I could have used the checklist then! Just like your monitor-powered speakers are unusual and easily overlooked, a few low-power speakers can be USB-powered, and without that USB cord plugged in, nutt’n’s gonna happen. One more obvious item. Make sure you speaker plug is in the correct input terminal on the back of the computer. Mine has 6 color coded terminals all of which will take the speaker plug. Only one is for the speakers. Which one is the correct on to plug into? The speaker jack on the computer is often green, otherwise try each one and see which one works. One of my laptops always lost sound after waking up from sleep. A hard reset was the solution. Under Hardware. The sound card in its self can fail. One computer I was fixing had very low sound output. Finally Googled a solution – pull the speaker plug a smidge out of the computer, not seated fully in. Seems strange, but it worked. 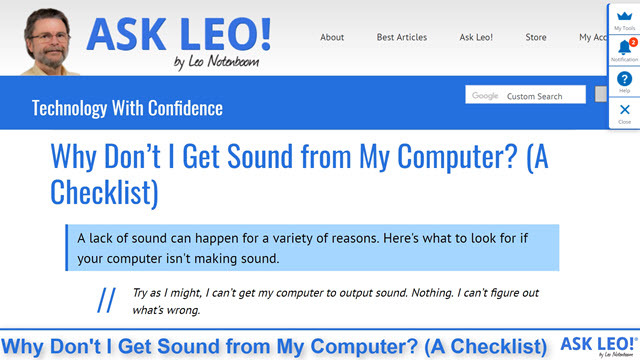 As Leo says, make sure the correct output device selected in Windows. I remember having no sound some years go, and found that somehow the dial-up modem I had then had become selected as my “Default device” for “Sound playback” under the “Audio” tab of “Sounds and Audio Devices Properties” in the Control Panel. Changing this to the sound card restored the sound straight away. Try to connect external speakers. My xp laptop with a very basic sound card lost the sound of the built-in speakers. Direct X diagnostics found nothing special. Ran a cd-rom version of Linux on it , same. But the external speakers work fine. I just leave it like that as it’s not a major problem. The laptop works on borrowed time anyway, with an external cooling fan. Desktop computers no longer come with built in speakers. Now you must connect external speakers. The speaker icon on the taskbar has a red x on it and the sound just stopped working. I get the message ‘one or more audio service isn’t running. I tried everything, searched all sound related subjects and nothing helps. Today my FL Studio (a music producing program) stopped making sound and it was acting a little weird. i shut it down, started it back up and then it was working again but a few minutes later it stopped making sounds even after rebooting it. Open your control panel and access the sounds that way. I’m too mad. I have searched EVERYWHERE imaginable to find an answer! I got an update on my work computer and now I cannot listen to Pandora. I listen to Pandora everyday so this is heartbreaking really. The windows 10 update decided to update without me knowing and now I do not know how to put sound back on my desktop. Thank you!! I couldn’t get my husband on the phone, and my TV show was on! I had been waiting for it all day, and the kids were finally in bed, and the sound didn’t work!! My two year old likes to pretend he knows how to use the mouse, and he probably did something, but I didn’t know what! Thanks, Leo, for saving my sanity after a long day!! I had a similar problem once. It turns out I had multiple ~6 different video players installed and one grabbed the audio while another tried to play the video. That happened when I was playing rented movies. Each movie production had its own player that installed in the background. The solution was to uninstall all the different video players and only use the native one. Buy powered speakers. Your computer doesn’t have enough horsepower to drive speakers. If your speakers work with another device (like your cell phone for example) and are powered, check the volume settings as described above. Notice since the Anniversary update (Aug 2) when you click on the volume icon now there will be an Ʌ in the top right corner. Click on the Ʌ, here you need to select the driver. Also if you have ever used both headphones and speakers, be sure Speakers is selected. I don’t get the same on mine. 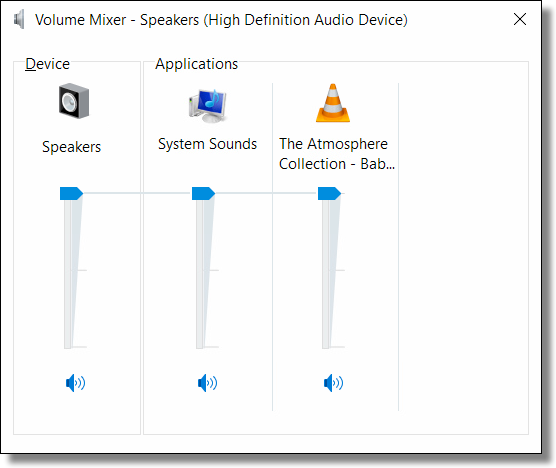 What you see when you click on the volume icon can be different depending on what software has been installed along with your sound drivers. We have two Windows 10 Home computers, one is a HP and has Realtek sound, the other a Dell, has Intel High Definition Audio. Both came with W7 and are kind of old. That may appear only if you have multiple output devices, but good point. When I view videos created by many different sources and skills levels (yes, like YouTube) I often encounter a video with a very low-level audio track. The obvious is to crank up the volume on my external powered speaker system, but that invites a surprise booming notification should I get an email while watching the video. Is there some way to invoke the equivalent of an automatic volume control, or must I simply be very vigilant that nothing else is running whenever I watch a video with lousy audio? Not sure if this will be to your liking, but I turned off all Windows notifications sounds because they don’t serve any purpose for me. I get mail so often, that even if the notification were very low, it would disturb me when working or watching a video. Unfortunately this REALLY depends on the capabilities of your audio hardware and software. There’s no general solution. First things first! Attach the speakers (with the same cables) to another computer and see if you get sound. Or plug a pair of headphones into the audio output jack. That’s probably the easiest for most people. For years and years, dating back to the 1980s, PCs had built in speakers. A few years ago I bought a refurbished PC from the local used-PC store. I struggled and struggled trying to find out why there was no sound. It turns out that they no longer put speakers inside the desktop PC box. The used-PC store gave me a speaker to plug in so I could have sound. Live and learn. 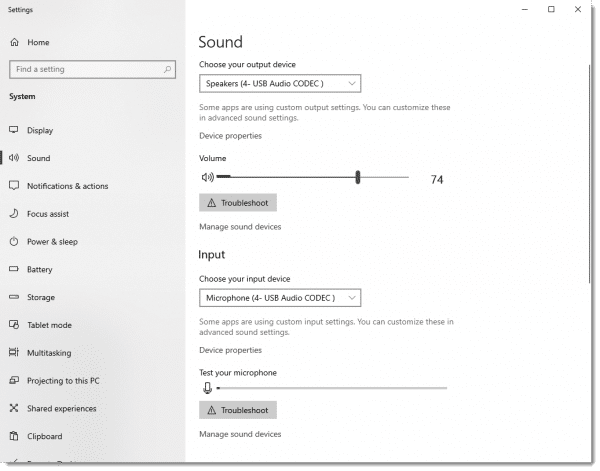 I recently had the no sound problem on my desktop with windows 10. I completed Leo’s checklist (including several cold boots) and still no sound. Out of frustration, I shut the desktop down, unplugged the tower and waited until the light on the power supply went dark, then, plugged it back in, booted it up and the sound was back. WEIRD! Rebooting the computer, or with other devices, shutting off, waiting 10-30 seconds, depending on the device or the technician, before turning it on again is often the first thing recommended by technicians. It often is what’s needed to get things working again. I was about to ;pull out my hair over the sound not working. The Realtek drivers installed fine, even the “loopy” demo played. Installed a Sound Blaster PCI card, still same problem. Booted on a Linux CD, also Installd a cloned hard disk backup from 6 months ago, sound was fine. Compared list of running services between versions. Discovered that “Windows Audio” service was disabled. Enabled it, all was well. It must have gotten disabled when I was trying to slim down memory resident stuff with Msconfig earlier, and didn’t notice the sound was silent. I have an Hp laptop and when I am using it, say playing solitare, the sound works then it quits for a while and then all sounds comer our at once. The PST file is likely still there. Search for *.PST and make sure to include hidden files. or copy the file to your new profile folder for Outlook. Look in Outlook settings to see where it expects to find the PST file. in order to copy the one with your stuff in it to the right folder. What is right to restart my pc after solving a sound problem? or to leave as it? It’s not right or wrong. It’s just inevitable. Sooner or later you will have to restart your computer. If the sound fails because of a restart then you haven’t really solved the problem. My issue is a bit different. I am adding a bluetooth speaker to my laptop. It installs and works at first. However, after I use it and resume other activity, it will no longer work. It actually has to be reinstalled every time I want to use it. How can I fix this? I have a Sony Vaio T Series Notebook and I am working with Windows 10. I have done all the “normal” things – set the speakers as default, updated drivers, etc etc etc – nothing has worked and I have no idea what to try now? Sounds like something’s simply trying to notify you. Without knowing the Windows version it’s hard to say where to look, but … look for notifications? Notice which apps are running? Maybe close all browsers and see if it continues (websites are one cause if they have auto-play audio). I can’t get sound ONLY on the News in Slow Italian program. For everything else the sound is fine. Please help me with that program’ sound. It was through that link that I was given your help software. Also, could get me a telephone number for the company that publishes News in Slow Italian? Thanks. Have you tried accessing that website using a different browser? Hey! I have a problem with my audio, where whenever I plug any type of audio (so far I’ve tried my headphones and earphones), some applications do not work properly or do not work at all… Once I unplug my audio source, my PC works fine. Any ideas? Next time she visits and uses my computer I’m making sure, she unmutes it when she’s finished typing. what a relief to find out, all I had do was click on the volume icon to get the sound back in my computer. If it was working, and it’s an older laptop, perhaps there’s actually hardware problem – like broken or disconnected speakers? I normally have sound with Mozilla on every site I go to except Dictionary.com! Dictionary.com gives you the definition and etymology AND THE PRONUNCIATION of the word defined. You click a speaker icon and you hear the word’s pronunciation but this does not happen with Mozilla ! Every other browser works fine except Mozilla! I’ve tried all the ‘fixes’ that have been offered; I download the latest player software and the sound will work for a short while then it just stops! I can click the speaker icon until my finger drops off but no sound! sometimes I copy the URL address and paste it in Chrome or Edge to hear a words pronunciation but I shouldn’t have to do that! How can this annoyance be fixed?? You may have a plugin in Mozilla that is interfering with the sounds. Perhaps a popup blocker. It might help to clear the cache as well. I have a problem with my Windows 7 PC. When I first start it up, it has no sound. If I leave it on for hours, it comes on by itself. This is no good when I need to use it first thing in the morning. Once I took my computer all apart to move it to paint my office. I put it all back together and the sound started immediately. However, without doing anything differently, it has gone back to its old habits. Just not giving me sound when I turn it on. Tonight, I’ve been waiting four hours or so, and there is still no sound. This worked really well! :D. I right clicked the volume button turned all the volume slides all the way down then picked them up. It made a noise, then tried it on youtube. It worked perfectly. Just to further complete the sound checklist, here’s one other situation that results in no sound. Today, I was using FastStone to watch a slideshow. Pictures displayed just fine – but no sound. It turned out that the folder that held the songs for the slideshow, well, I had forgotten I had changed the folder name ever so slightly. So the software couldn’t find the songs … so no sound. My sound switches off a few times daily. I automatically restart the “Windows Audio” service. It’s one of my hobbies. Does anyone know how to restart the service with a single click? It’s exhausting having to click on the desktop icon to get the Services dialog, scroll to Windows Audio, and click on Restart. This may be slightly off topic. I don’t use a “monitor” for my computer. It requires external speakers for sound. For several years now I have always purchased an LCD TV & lately an LED TV. they all have a PC input or HDMI input & TVs come with their own speakers. I think you’ll find buying an LED TV today is less expensive than purchasing an equivalent size monitor, especially as you get into larger screen sizes. Unless you’re an audiophile that must have high quality external speakers, you’ll most likely be satisfied with the TV built-in speakers. They’re much better than they used to be. Just food for thought. Every now and then, I find the main speakers are silent and I check all the usual suspects with no success until I remember I was using headphones and they are still plugged in. Once I unplug the headphones, the main speakers work!